This is one of the easiest, high reward DIY projects you can do as a homebrewer. For just over $25 and about 10 minutes of your time you can build a hop spider which will dramatically reduce the hop particles and other particulates in your beer. First, a run to Home Depot or local hardware store. You can use what ever PVC pipe you want to save some money; I liked the cast iron adaptor since it created a longer funnel shape and would give me more room to attach the hop bag. After you have the parts, drill 4 holes in the PVC pipe at the wide end so that holes are at 90 deg angles from each other and about an inch down from the top. I laid the rods in an X over the top to get the holes even. Attach the 4 rods with lock washers, washers, and nuts. There should be a washer and nut on the inside of the tube and a nut, lock washer, and washer on the outside. I made sure that there was no excess threaded rod protruding into the funnel. 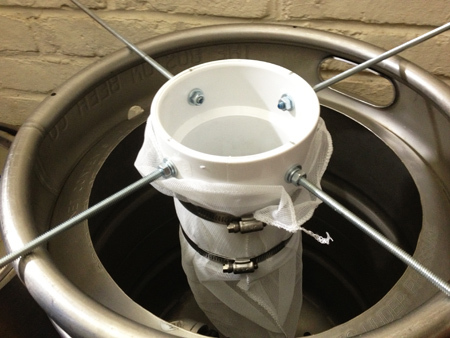 The hop bag will fit around the narrow end of the funnel and is secured with 2 3″-5″ hose clamps. You probably only need one, but at a $1.85, why not have the added security of a back up. With the bag attached he only thing left to do is brew some beer! Next story Simply Peter on Fuhmentaboudit!